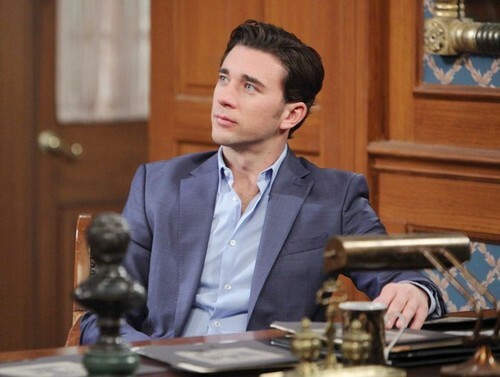 “Days of Our Lives” spoilers for Thursday, May 14, reveal that Abe (James Reynolds) and Roman (Josh Taylor) will realize Stefano (Joseph Mascolo) poses a serious threat to Marlena (Deidre Hall). Fortunately, there might be someone who can help. Abe and Roman will approach Chad (Billy Flynn) and ask for his assistance in getting through to his father. Chad recently admitted to Abigail (Kate Mansi) that he’s worried about Stefano drawing him to the dark side. This could be Chad’s chance to prove he’s not as sinister as the rest of the DiMera clan. Other “Days of Our Lives” spoilers tease that Daniel (Shawn Christian) will want Nicole (Arianne Zucker) to give him another chance. Nicole told Daniel she was done with their constant arguing, but he still feels that there’s hope for their relationship. However, Nicole has to get updates on what Serena (Melissa Archer) is hiding before she can even think about getting back together with Daniel. DOOL fans know that Nicole can’t get closer to Xander (Paul Telfer) unless he believes Daniel is out of the picture. That means Nicole has no choice but to put Daniel on the backburner. Nicole cares about Daniel and she’ll naturally feel bad about keeping him at a distance. Nevertheless, Eric (Greg Vaughan) is Nicole’s friend and she’d feel even worse if she let Serena get away with the scam she has going. In fact, Nicole’s efforts could mean her feelings for Eric run deeper than just friendship. “Days” rumors say that Nicole will begin to bond with Eric once all the drama surrounding Serena fizzles. It sounds like DOOL viewers might see an “Ericole” reunion at some point in the future. As for Serena, the walls are closing in and she’s starting to get frantic. “Days of Our Lives” spoilers hint that Serena will contemplate doing something drastic to prevent Xander from destroying her life. We don’t know for sure what Serena’s plan will be, but you can bet that it won’t work out. The end is near for Serena and her whole scheme will likely crumble. Stick with the NBC soap to watch Serena crash and burn. So “Days” fans, what do you think about the news that Chad may be the one to save Marlena? Will Nicole ruin any chance of reconciliation with Daniel by following through with her plan? What will Serena do now that her scheme is falling apart? Let us know what you think in the comments below and don’t forget to check CDL tomorrow for the latest “Days of Our Lives” spoilers, rumors, updates and news. ‘Days of Our Lives’ Spoilers: Eve and JJ’s Affair Revealed – Are Paige and Eve Both Pregnant by Boyfriend?